Google has recently released some code updates, and unfortunately these updates are causing troubles to Blogger users that are using Internet Explorer browser with the Old Blogger Editor. In this post, I will show three techniques to temporarily work around this issue. Method 1: Change to Updated Editor. The issue is only affecting those who are still using the Old Editor. You won't be seeing the problem if you upgrade to the Updated Editor. It has been out for quite some time now, and it has lots and lots of new features. 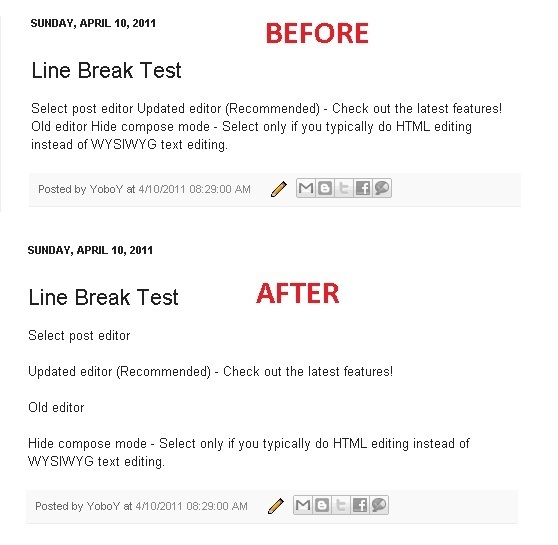 Besides, with the upcoming New Blogger Layout, I think it will be a good idea to tame yourself with the Updated Editor, if you have not already done so. 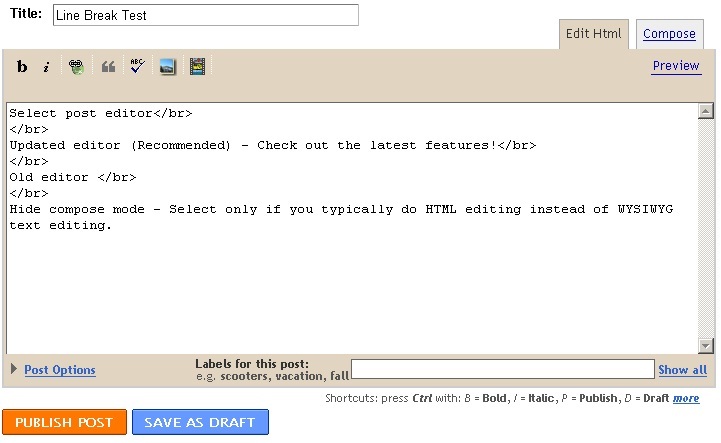 To upgrade to the Updated Editor, go to Dashboard - Settings - Basic - Select Post Editor - Updated Editor - Save Settings. Method 2: Change your browser. You will only be seeing this problem if you're using Internet Explorer (and probably AOL browser as well). Switch to a different browser, and your line breaks will be fine. So far, users who have been using Firefox, Google Chrome, Opera, Safari and other browsers have not reported any problems. Try to get any one of these browsers to mitigate the issue. Method 3: Introduce Line Breaks manually. 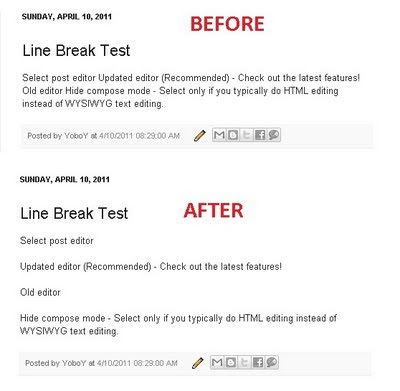 If you're reluctant to switch to a different browser or editor, then you're left with only one choice - you have to introduce the line breaks in your posts manually (at least until the issue is solved). In other words, place the tag </br> wherever you want to see a line break. If you'd press the keyboard 'Enter' key twice to start a new paragraph, then you should insert the </br> tag twice instead. Once you've placed the tags, DO NOT GO BACK TO COMPOSE MODE. 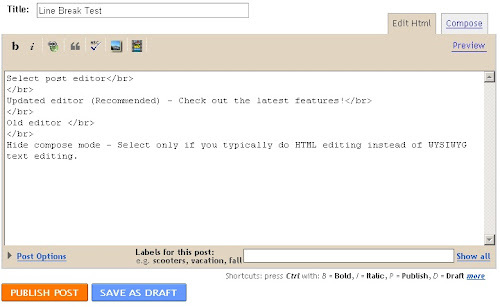 Switching between compose mode and Edit HTML mode will remove the manually added </br> tags. See the screenshot below if you still need help with this. "Life isn't about waiting for the storm to end, it's about learning do dance in the rain." Okay, well here is my question: I use IE and I have A LOT of trouble with TOO MANY line breaks appearing anytime I switch between edit HTML and rich text. It is very frustrating when I have to go back again and again and edit those line breaks after editing something else in my post. Most of the time I just end up saying to hell with it! Is there something I am doing? Is it Blogger? Is it IE? I have Firefox, but would prefer not to switch. I've been using IE for so long it has sort of become my comfort zone. @Stephanie: To be precise, it is IE with Blogger's Old Editor. If you don't want to change your browser, you must change your editor, at least for the time being. Go to Dashboard - Settings - Basic - Select Post Editor - Updated Editor - Save Settings. I don't know why no one else is pointing this out, but I've been using the updated editor for months and just started having this problem. The problem exists even with the updated editor. @Beacon: Someone has pointed this out back in the forum. Unfortunately, you only have 1 option - that is to change your browser (at least for now). To those who have been using the Old Editor with IE, switching to the Updated Editor seems to solve the problem - at least for the time being. Hmm. I have the updated editor. Ah well. Thanks though. Maybe one of these days I will just move on from IE. LOL!